The state’s control over the body is paramount. In 2012, the same year that the Department of Defense admitted that the armed services had a “suicide epidemic,” Pvt. Lazzaric T. Caldwell was handed a court-martial six-month incarceration on Article 134 grounds for slitting his wrists. There was court-admitted evidence that the marine had PTSD and depression. The military judge noted that it was an odd charge, because “it is basically criminalizing an attempted suicide,” but convicted anyway. One year later, Caldwell’s conviction was overturned because it was deemed that his particular actions fell short of an Article 134 violation, but the judge did not use the occasion to decriminalize suicide attempts tout court. The military criminalization of suicide is inconsistent—service members who succeed in killing themselves are given honorable treatment and their dependents get full benefits. Failed attempts can be punished with prison. The criminalization further stigmatizes mental illness and may worsen the military’s “suicide epidemic.” But the message of a criminalized suicide attempt in the military remains the same as in archaic common law: To act as a sovereign individual over your own life threatens order, because you are not a sovereign citizen, you belong to the state. For whom else can this be a fiercer fact than for a prisoner like Pvt. Manning, convicted of a politically charged crime? Numerous mental-health professionals have noted that Manning’s punishment can only harm a person in mental anguish (or any person, for that matter.) “It’s a sure-fire way to worsen symptoms,” Ron Hornberg of the National Alliance on Mental Illness, told The Guardian. An American Civil Liberties 2014 report found that 73 percent of suicides in prison occur in solitary. But Manning’s punishment is only counterproductive if we assume the military cares about her mental state. The latest punishment speaks for itself, as does her harsh 35-year sentence: Manning would have been martyred in death. The state needs her to live, but suffer, as an example. We see a similar function at play–the maintenance of prisoners in a state of bare life–when inmates on hunger strike with a public profile, as in Guantánamo Bay, are force fed (deemed torturous by the international medical community). Right now, while prisoners across the country enter a third week of a labor strike, inmates in both Wisconsin and Ohio prisons are engaged in a hunger strike to protest long-term isolation (among other harsh treatments). The Wisconsin food refusals began in the notoriously brutal Waupun Correctional Institution in June. One participant, LaRon McKinley Bey, has been in solitary confinement in Wisconsin’s prison system for over 25 years. The United Nations has stated that over 15 days in isolation can constitute torture. While information is limited, support networks communicating with the hunger strikers say that participants are being aggressively force fed. The slogan of the strike is “Dying to Live.” It serves the prison better if the strikers live, but barely, and without a scratch of personal sovereignty. To be sure, hundreds of prisoners are left to die or self-harm in obscurity in US prisons. Suicide leads to more prisoner deaths than homicides, overdoses, and accidents combined, according to the Bureau of Justice Statistics. But as Italian theorist Giorgio Agamben argued, the state needs the Homo sacer (sacred or accursed man)—the person stripped of the human and legal rights of a citizen, but still kept under law. This figure affirms that there are no gaps in the state’s control over human life. Manning’s suicide attempt is punished as a “threat” to order because it’s legible as a threat to the state’s management of her life, and ability to punish. “I am feeling hurt. I am feeling lonely. I am embarrassed by the decision. I don’t know how to explain it,” said Manning in a statement following her sentencing. 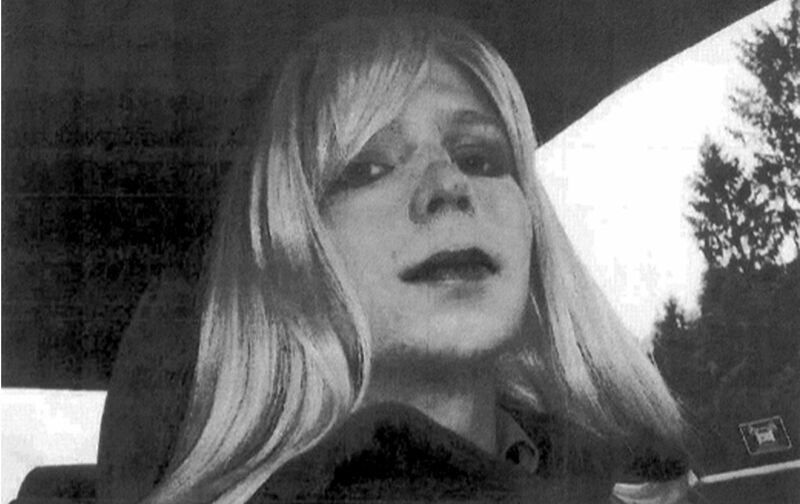 Manning has not forfeited her sense of individual sovereignty, nor mentally submitted to the state’s seizing of it. Given the strong correlation between solitary confinement and suicide, Manning’s isolation punishment for a suicidal act carries the grim color of a Dantean hellscape. A circle of repetitive punishment to echo the condemned act. The subtext: Abandon all hope, ye who enter here. There may appear to be a contradiction in the government’s recent decision (after long delays) to permit Manning’s gender-affirming surgery. The decision came in response to Manning’s going on hunger strike, explaining in a public statement, “I need help. I am not getting any…. I was driven to suicide by the lack of care for my gender dysphoria that I have been desperate for. I didn’t get any. I still haven’t gotten any.” One desperate act—attempted suicide—led to punishment; another—food refusal—led to the military meeting her overdue, medically affirmed, needs. But the decision to grant Manning’s surgery is in step with the military’s 2015 decision to accept transgender service members. It also aligns with nationwide Bureau of Prisons directives, which assert that it is the right of prisoners to receive whatever form of gender-affirming treatments are deemed medically necessary. Finally, providing surgery can be seen as a recognition that Manning would die of starvation or suicide without the treatment. And Manning must remain alive in order to serve her sentence. In her essay on Homer’s Iliad, a powerful reflection on the operations of power, French philosopher Simone Weil calls the “force that kills” the “grossest and most summary form” of power. The force that is more “surprising in effects” is that which has not killed yet. “It will surely kill, it will possibly kill,” she wrote, “or perhaps it merely hangs, poised and ready, over the head of the creature it can kill at any moment.” Whenever this threatening force is present, “its effect is the same: it turns a man into a stone.” Weil resisted this force that does not yet kill; she died at 34 from self-imposed starvation in 1943, allegedly refusing food in solidarity with victims of the war. Her death has been criticized and derided, but none can say she was turned to stone by the force that does not yet kill. That same force hangs over Manning, and all prisoners reduced to bare life. Like the prisoners striking around the country, Manning again and again resists the state’s efforts to petrify.